Making compost is a sustainable process. 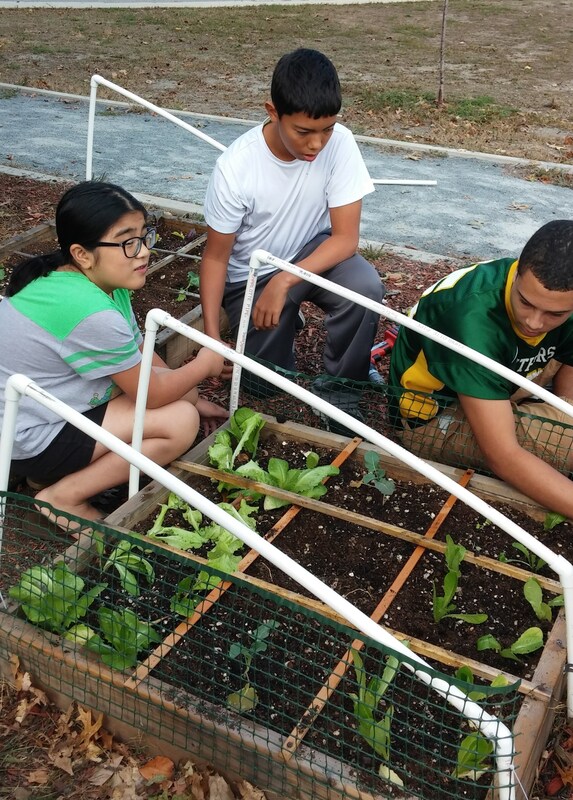 Students at our Honduras Hope Dorm are developing organic gardens. They make compost and are growing food to be used as a nutritional base. Their next project will be to bring this technique to their mountain village and teach their families to grow without chemicals. The students at the Dorm are champions. Application for many students leads them to conceptual learning. First seeds must be planted in their minds. I had a great afternoon at Allerton House in Hingham. There is a real possibility that we may be able to start worm farming at Allerton. The presentation on Square Foot Gardening was received with lots of enthusiasm. Many of the people there have vegetable gardens that they tend however the location is less than suitable. Summer plants need sun, sun and plenty of sun. With the flexibility of raised Square Foot Gardens, finding sunny locations is not a problem with all the open space. It is important that people learn to enjoy organic choices. It is my hope that as residents at Allerton get involved, they will share their joys, insights and enthusiasm for the beginning of sustainable living with their love ones. I will be posting as this evolves. I hope that I will be able to do justice while sharing their enthusiasm for composting with worms and Square Foot Gardening raised thirty two inches off the ground. Our farmland is polluted with years of spraying chemicals, pesticides and herbicides. Many of the plants that we compost contain those same poisons. So where can we turn? The ocean is polluted as well but the massive amount of water allows for the chemicals to become diluted. We must consider however the runoff from land and roadways as part of the calculation. Using kelp seems to be a reasonable alternative. 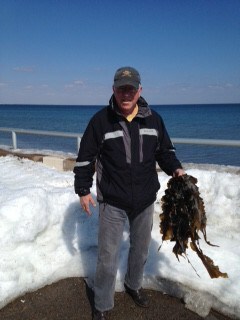 The kelp I am holding in the photo is from Nantasket Beach in Hull. Students at Quincy High School determined while preparing for a science fair that the kelp needs to be washed twice in order to reduce salt content for composting. The salt was causing red wiggler worms to be lethargic without a couple of rinses. The students also found that too much soaking reduces mineral content found in the kelp. Students too can make a difference. Having a great chemistry teacher as a mentor goes a long way. Having a wonderful wife to walk the beach with gets me there. Farmers are trying to improve the ability of water to reach the roots of plants by improving the organic composition of the soil. According to an article on agronomics in the January issue of Successful Farming, it takes five years to improve soil conditions 0.01% of no till composting. Water will penetrate the soil 0.4 inches more readily when 0.1% of the soil is improved with organic material. It is hard to imagine that it takes 100 years to produce one inch of humus in a deciduous forest. Yet we can use worms to compost 50% of their body mass daily. The reason that Square Foot Gardening works so well is that most of the material in each square is organic. When using commercial composts however the percentage of inorganic material may be significant. 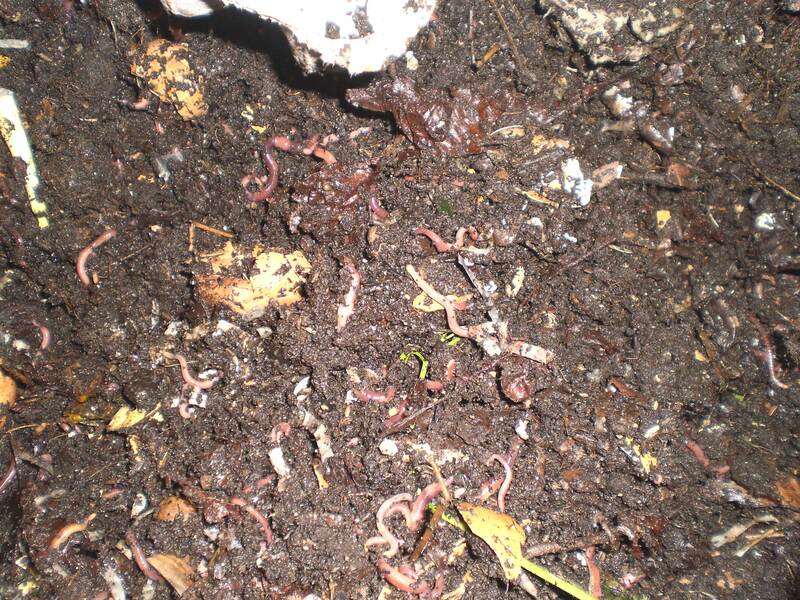 When using worm compost the percent of inorganic material is very small. The other materials of peat moss (would prefer coconut core) and vermiculite both absorb water easily. The plants can only go through the process of photosynthesis if there is a sufficient supply of water and proper root development. 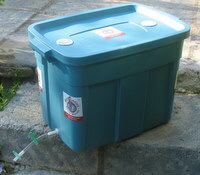 I am currently using worm castings for 25% of the Mel’s Mix formula. The roots always have access to plenty of water because of the organic composition of the medium used. The equation here is to produce more yields in a limited amount of space. In addition, more nutrients are absorbed when readily available to the roots. We are all looking for mineral rich vegetables. Microbes in the soil create a natural environment for plants to grow without pest controls. A great book on this topic is Teaming with Microbes. Two weeks and the days get longer and there are sunny days a head. It is time to get going. Before the days of planting there is plenty to do. Making worm castings for your seedlings will provide instant success. The Worm Ladies can share valuable experiences. I am giving compost tea, bokashi and worm castings in a Yankee Swap for Christmas. The dollar limit is $10.00 but the recipient will get a $22.00 value. One pound of worm castings sell at the local hydroponics store for $24.00 a gallon. You can order worms and castings from the The Worm Ladies.